One landscaper shared his experience of running a debt-free company. One discussed his company’s initiative to hire veterans in response to the troublesome labor issue. Another brought up her company’s decision to hire a bilingual HR specialist to serve as the go-between for Hispanic employees. Despite the differences, all these companies had one thing in common: the desire to become a Destination Company, a term coined by consultant Jeffery Scott. “Becoming a Destination Company means taking the road less traveled,” Scott said, citing Drost Landscape as an example. Drost is a 27-year-old company that’s poised to grow by 25 percent this year, in part, because of its decision to create a general manager position. Hosted by the National Association of Landscape Professionals, the workshop tackled issues such as onboarding and employee engagement, open-book management, the pros and cons of employee incentives and building a leadership team. It took place in Nashville, Tenn., Aug. 28-29, with about 70 landscape professionals attending from across the U.S. The companies represented ranged from several-employee operations to 100-plus-employee organizations. The workshop also was held in Baltimore, Aug 21-22. Throughout the two days, Scott encouraged attendees to share ideas among other landscapers, setting a goal for each landscape pro to meet at least 20 different people. “During these two days, you will learn one-third from me, one-third from your peers and one-third from yourself,” Scott said. 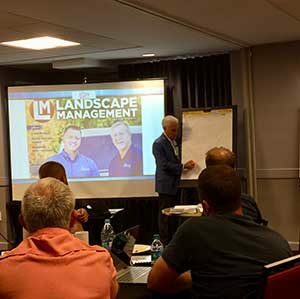 The landscape pros in attendance completed various workbook exercises and discussed practices that had and hadn’t worked well in their companies. Guest speakers Brian Edwards of Color Burst Landscapes in Brentwood, Tenn., and Seth Kehne of Lawn Butler in Knoxville, Tenn., rounded out the agenda and discussed a few guiding principles of their companies: relationship building, clear communication, solid branding and, in Kehne’s case, running a debt-free company. Following the workshop, many of the strategy conversations pressed on throughout the evening as landscapers indulged in dinner and drinks in downtown Nashville.